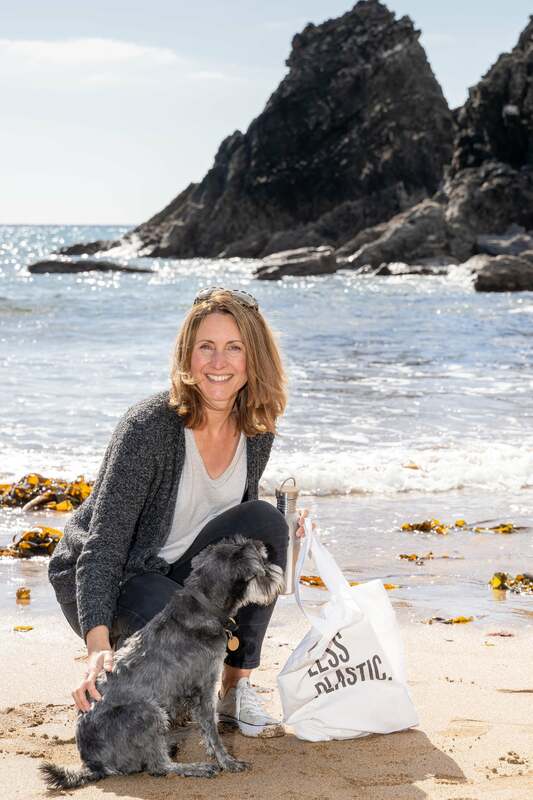 Businesses of all sizes are well-placed to make a HUGE difference when it comes to tackling the ocean plastic crisis. Whilst individual efforts to use less plastic add up over time, cutting plastic usage at a business-level results in significantly greater reductions in plastic waste and far-reaching consequences – creating a ripple effect of positive change among colleagues, customers, suppliers, competitors, industry and the wider community. In 2015, we produced over 320 million tonnes of plastic globally – which is more than the combined weight of every human alive on earth today! Based on our current usage, global plastic production is set to double over the next 20 years – unless we collectively change our course. At this point, it’s important to realise that we have no effective means of getting rid of this durable material that we’re using and discarding as if there’s no tomorrow. The vast majority of plastic ever made has gone to landfill or escaped into our environment. We can’t recycle our way out of this mess because our current recycling infrastructure is not fit for purpose. Just 9% of plastic ever produced has been recycled and today much of the Western world’s recycling is simply shipped overseas and dumped in countries that lack the facilities to deal with it. 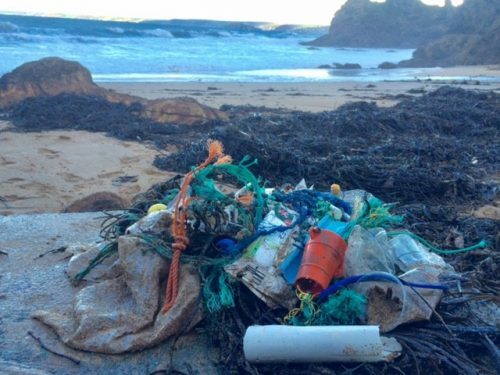 Whilst innovation and initiatives such as the Bottle Deposit Return Scheme will hopefully increase recycling rates and make the circular economy part of the solution in the future, we need urgent damage-limiting action to protect our oceans TODAY. With a truckload of plastic entering our oceans every minute, the most efficient thing we can do is to learn to use significantly less plastic in the first place. You can make a real difference to the ocean plastic crisis by committing to use less plastic in your workplace. Using less plastic in the workplace is not rocket science. It simply requires investing some time and effort to review how much plastic waste you currently generate and also commitment at all levels to rethink how you do things to minimise your company’s plastic footprint. The first step is education – your colleagues need to care about the issue in order to want to do something about it. Thanks to Blue Planet 2 and recent high-profile media coverage, many of your colleagues may already care very much about the state of the oceans and will be heartened to see your business taking action. However, many may still require more inspiration or information to motivate them to make changes. Why not hold a talk about ocean plastic in your workplace? You could either get someone internal who is passionate about the problem to share their concerns or invite an external expert to come and inspire your team with first-hand stories of the devastation that plastic pollution is causing to our natural environment and to share insights and practical strategies to use less plastic in their personal lives and professional roles. Alternatively, you could arrange a screening of an inspirational film such as Plastic Oceans or Trashed to start a wave of change within your organisation and persuade your colleagues to rethink their plastic usage. One of the best ways to get people engaged with the issue is to let them see for themselves the scale of the problem. Nothing beats first-hand experience – seeing and taking on board that the plastic we all use in our everyday lives spills out into parks, countryside, rivers and oceans – even when we think we have disposed of it responsibly. When plastic escapes into our environment it’s not simply due to littering, it is down to inappropriate and excessive use of plastic by manufacturers and retailers. This is likely to include your organisation too. We have all been part of the problem and we can all take responsibility to play a part in finding solutions. A team clean-up is a great way to bond by doing something meaningful together and it will help focus your organisation’s plastic reduction efforts too. You’re likely to pick up lots of single-use and disposable plastic and polystyrene during your clean up. 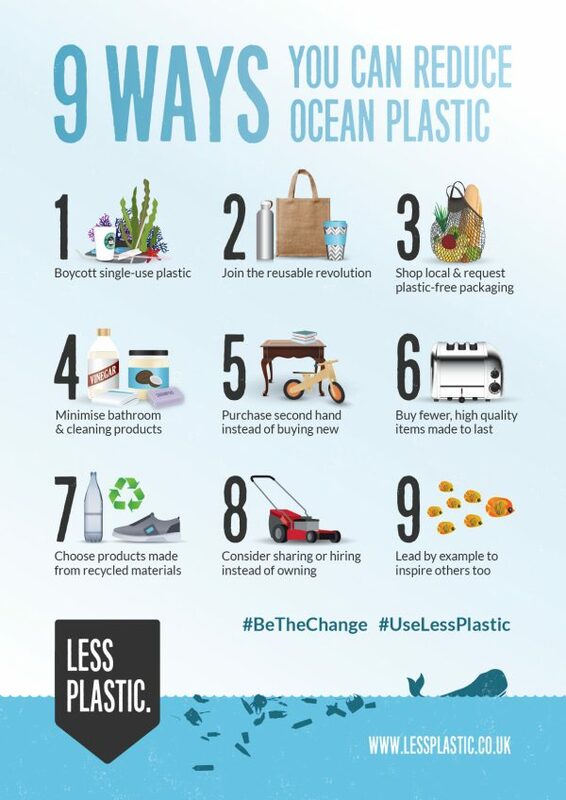 Make these your top priorities when it comes to thinking creatively about alternatives that will enable you to reduce plastic used in your business operations – see point 7. 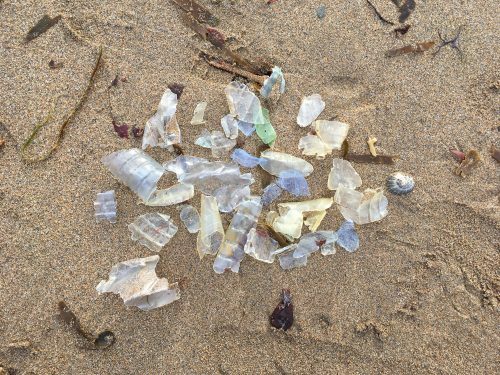 Single-use plastic water bottles are among the most common items we find washed up on the beautiful beaches near our home in South Devon. Globally we get through a million plastic bottles a minute – a statistic that is both mind-boggling and devastating, especially given that in many countries today the tap water is safe, free and more regulated than the bottled water industry. Show you’re serious about reducing plastic in your workplace by installing a mains-fed filtered water cooler or by putting a water filter on the office kitchen tap. Filtered tap water tastes better and is healthier than bottled water. If you promote the fact you offer free, unlimited water refills in your workplace, your colleagues will ditch their disposable water bottles and switch to refilling reusable bottles instead. There’s no place for disposable plastic cutlery, plates and cups in modern businesses or societies. We now know that with plastic, there is no such thing as ‘away’. A single-use plastic utensil is useful for minutes yet will stay in our environment for centuries – harming or killing wildlife, polluting our oceans and damaging our eco systems. The resources required to manufacture, transport and distribute disposable serveware do not warrant the so-called ‘convenience’. In fact, the vast volumes of disposables languishing in landfill or escaping into our natural environment and causing harm for centuries is very ‘inconvenient’. It’s much better to opt for reusable, washable serveware that can be used again and again, or encourage colleagues to bring their own (plates, cups, bowls, cutlery, lunchboxes, etc.) and provide facilities for washing them after use. 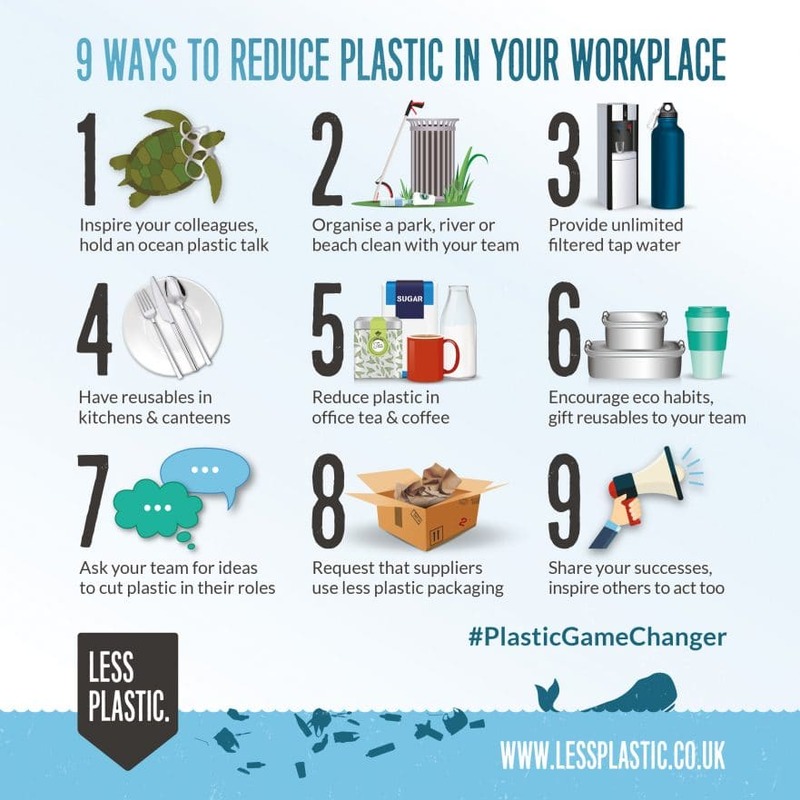 Whilst it might be impossible to completely eliminate plastic from office tea and coffee making, there are steps you can take to minimise it which add up over time to a massive reduction in the plastic waste generated by your workplace. Firstly, try to source milk delivered in reusable and returnable glass bottles. Find Me a Milkman is a great place to start. Secondly, sugar in paper packets (decanted into refillable tins if you prefer) are better than plastic pots of sugar. Did you know that most tea bags have plastic in them? You can enjoy a plastic-free brew by offering loose leaf tea or opting for tea bag brands that avoid using plastic, such as Pukka. As for coffee, Steampunk Coffee Roasters offer freshly roasted coffee beans in plastic-free packaging. Alternatively, choose ‘less plastic’ options, such as glass jars (just the lid is plastic) or tins of coffee. If you have a Nespresso/pod machine, invest in a couple of reusable stainless steel coffee pods such as WayCap to drastically reduce plastic waste. Finally, it goes without saying that it pays to have reusable mugs and spoons and a place for them to be washed up. When you think about how many cups of tea and coffee you and your team consume in a year, you’ll realise that this is an area where some small changes will really count! If you have budget, a great way to set the tone is to gift your whole team with a key reusable item, such as a water bottle, coffee cup or lunchbox – whatever you think they would most appreciate. There is also the option to brand these, if appropriate. Alternatively, you could wait to gift team members with reusables individually when it’s their birthday or to recognise good work. 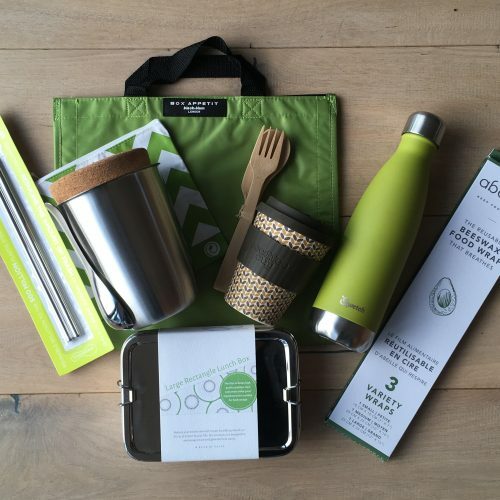 Giving reusables as gifts (both at work and in your personal life) is a great way to encourage eco habits among people who may not have got around to buying key reusable items for themselves yet and would appreciate a little nudge to help them reduce their reliance on single-use plastic. The people with the best insights into exactly how to cut plastic usage in your workplace are your team. They are the ones who know the biggest sources of plastic waste in your business. They may need a little prompting at first, to open their eyes to the damage that disposable plastic is causing so they understand WHY you want to use less plastic, and also encouragement to rethink HOW your business uses plastic – but once they get their thinking caps on they are sure to come up with some brilliantly creative solutions and ideas for doing things differently. At Less Plastic we offer workshops to facilitate brainstorm sessions with your team to identify the quick wins and the areas which will have the biggest impact on your plastic reduction efforts. Alternatively, you could also run these sessions internally, or invite colleagues to contribute ideas to a nominated Less Plastic champion within the business who can collate and prioritise them and make sure they are implemented. 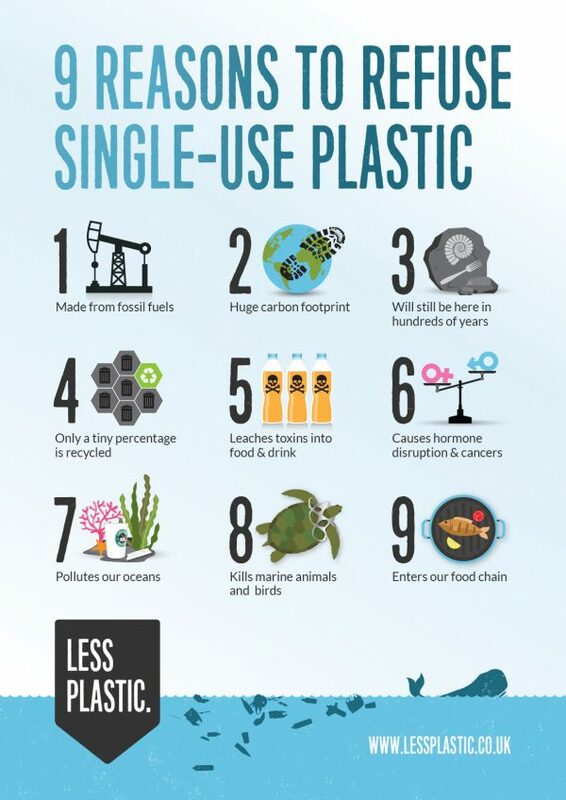 It’s important not to be disheartened or overwhelmed by the scale of your current plastic usage. You’re unlikely to be able to eliminate all plastic from your operations, however there are many creative ways to replace, remove, reduce or reuse plastic rather than continuing to treat it as a disposable material. For example, returnable, reusable, refillable packaging is a great option to explore. See Splosh for inspiration. Rethinking plastic usage in every department is a very useful exercise. For example in Marketing, instead of using balloons or cheap disposable promotional materials, consider investing in reusable bunting or fewer, higher quality yet more useful promotional items such as branded reusable water bottles or coffee cups. Making consistent reductions in your plastic usage over time adds up to make a big difference. Many organisations feel helpless when it comes to the amount of plastic packaging that is delivered into their business from suppliers on a daily basis. However, as the client, you have more sway than you realise, especially in the current climate when many are taking to social media to share shocking pictures of excessive and pointless plastic packaging. To keep relations positive, the best approach is to draft a formal letter explaining your objectives to cut your business plastic footprint, with guidelines of how you would prefer to receive your deliveries in future. You could experiment with a traffic light system, where red is a no-go (e.g. polystyrene, one of the worst packaging offenders) amber is acceptable (e.g. recyclable polybags) and green is preferred (e.g. returnable and reusable packaging or recycled and recyclable cardboard). One side-benefit of receiving less plastic in your deliveries is that you will save money on your business waste costs. Another is that by speaking up and requesting that your suppliers address this issue, you’re likely to cause a ripple effect through the supply chain as the positive changes that are made to meet your requests impact other suppliers, clients and competitors too. 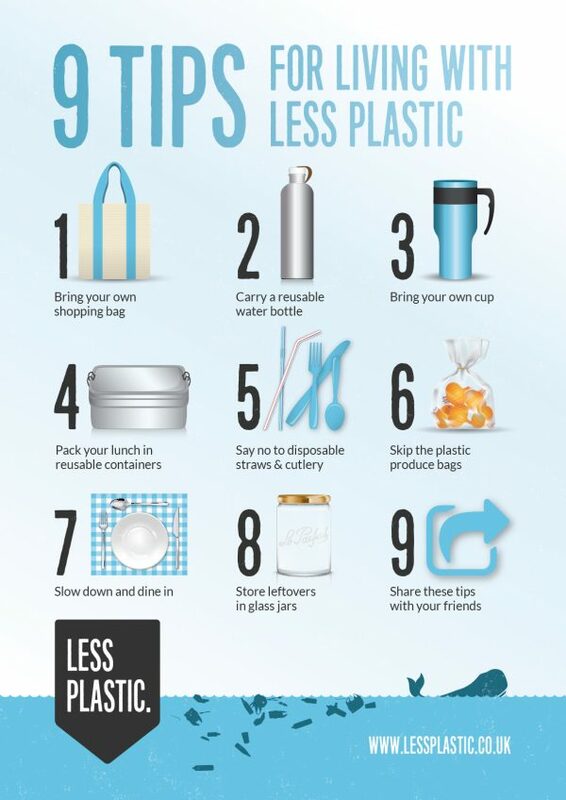 Start your less plastic journey by measuring approx. how many bags of landfill and recycling waste your organisation generates on a daily/weekly/monthly basis (as well as approx. weight) so you can easily report improvements once you start implementing the changes above. Once you have some impressive ‘then and now’ statistics and examples of how your business has cut its plastic waste, be sure to share your stories to maximise the opportunities to inspire others to take action too! 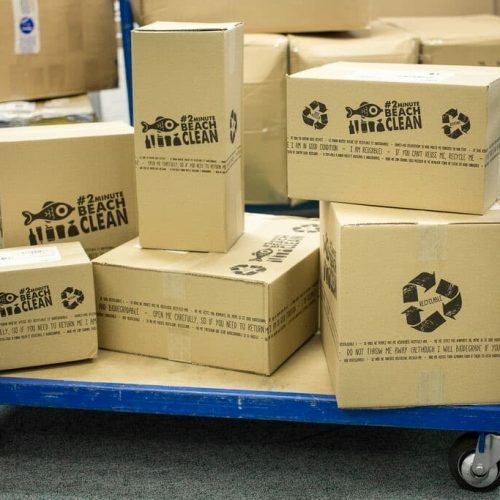 Online retailer, Surfdome, made changes to their packaging practices that resulted in 14 tonnes of plastic savings annually – the equivalent of preventing 650,000 plastic water bottles from escaping into the oceans every year. We helped them share their best practice via an infographic designed to inspire other businesses in many industries to make positive change too. Using less plastic in your business is not about achieving zero waste perfection because unfortunately in the world we live in today that would be virtually impossible, and the scale of the challenge would prevent many businesses from even trying to reduce their plastic footprint. Instead it’s about recognising that we can’t go on as we are – treating an indestructible material as disposable waste. There’s an urgent need for us to collectively change our mindset around plastic and channel our creativity to come up with better ways of doing things that are more mindful of our limited resources as well as the huge impact our daily choices have on our fragile environment. ‘Pollution is a design choice’ – we need organisations of all shapes and sizes to choose better and to start the process of reducing plastic in their workplaces today. 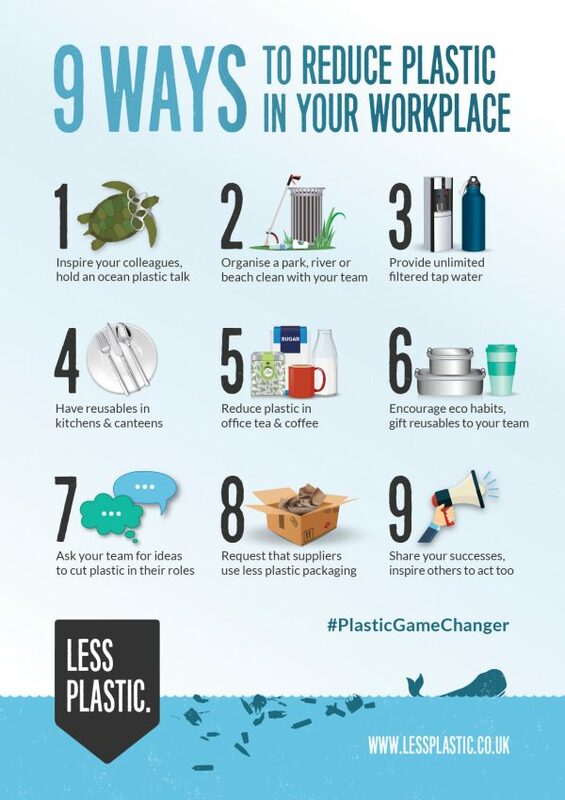 For more support, read our ‘5 steps to become a Plastic Game Changer’ in your business. Discover more tips and strategies to use less plastic in your business. Thanks for the great article Amanda, really appreciate the time you’ve put into creating this and its incredibly thoughtful.